Complete Defend Iacon on any difficulty. Complete Kaon Prison Break on any difficulty. Complete To the Core on any difficulty. Complete Aerial Assault on any difficulty. Complete One Shall Stand on any difficulty. Revive 5 Autobot soldiers in Defend Iacon. Shoot the 3 Hidden Laserbeaks throughout Kaon Prison Break. Save the Slug before it is executed in To the Core. Fly through the coolant tunnels in 23 seconds in Aerial Assault. Get smashed by Trypticon's hand as he falls into the energon goo in One Shall Stand. Complete Dark Energon on any difficulty. Complete Fuel of War on any difficulty. Complete Iacon Destroyed on any difficulty. Complete Death of Hope on any difficulty. Complete The Final Guardian on any difficulty. Kill all but 1 of the neutral prisoners in Dark Energon. Find and disable all security trip-wire switches in Fuel of War. Destroy the planets in the Stellar Galleries in Iacon Destroyed. Race across the Chasm Bridge in 33 seconds in Death of Hope. Destroy all cover in the arena in The Final Guardian. Complete both Campaigns (Any Difficulty). Ignite a Brute's back 5 times in Campaign or Escalation. Destroy a Jet Soldier's foot thruster 5 times in Campaign or Escalation. Headshot a Cloaker when it is invisible in Campaign or Escalation. Kill 2 Snipers in 5 seconds in Campaign. Multi-Kill 3 car soldiers at once using an explosive weapon in Campaign or Escalation. Destroy 100 Spiders in Campaign or Escalation. Melee-kill a Jet Vehicle in the air in Campaign or Escalation. Finish any level in Co-Op. Finish any level in Competitive Co-Op. Earn a 1st Place MVP award in any Multiplayer mode. Reach level 5 in any single class in Multiplayer. Reach level 25 in any single class in Multiplayer. Reach a combined class level of 50 in Multiplayer. Reach a combined class level of 75 in Multiplayer. Reach a combined class level of 100 in Multiplayer. Spend 25,000 Power in Escalation mode. Complete the 15th wave in Escalation. Destroy all hidden Autobot symbols in the Decepticon Campaign. 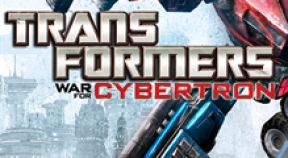 Destroy all hidden Decepticon symbols in the Autobot Campaign. Get 10 kills with a single detached turret in any mode. Get 3 kills while downed in a Co-Op Campaign or Escalation mode. Ram-kill against an enemy who is stunned by an EMP grenade in Campaign or Multiplayer.